NOTE! This packet is a part of a Cut, Paste and Complete GROWING BUNDLE . If you have already purchased the bundle, please do not buy this packet individually. Students simply cut out the picture squares, then match the answers on each picture to the space on the grid. The image squares are then pasted in this grid position. When all of the squares are pasted into place, a picture will appear. 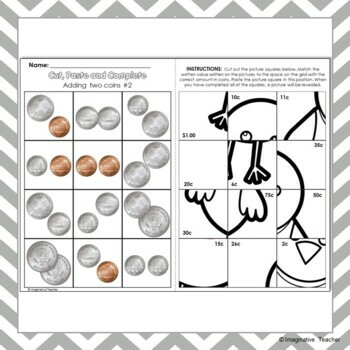 The worksheets increase in difficulty and come in a mix of 6 and 9 square puzzles to cater for varying ability levels. 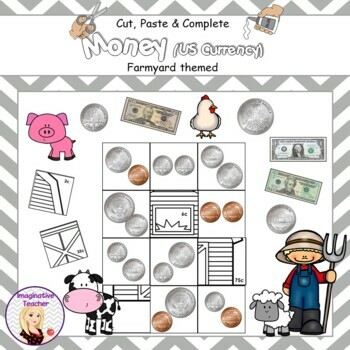 My students really loved completing these money worksheets and they are ideal for both a whole class task and for individual / center work. These worksheets are self-correcting. The students will know if they have all the answers correct because the picture will be completed. 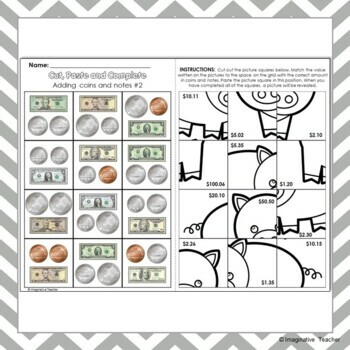 Images are included on the last 2 pages to show you what the finished worksheets will look like. The coin and note images are intentionally in black and white to reduce on ink usage. CLEVER TIP: A co-worker of mine enlarged and laminated these pages to A3 size. She then used Velcro dots for each square so that she could have a reusable center for her numeracy rotations. Check out the other 'Cut, Paste and Complete' sets I have available.